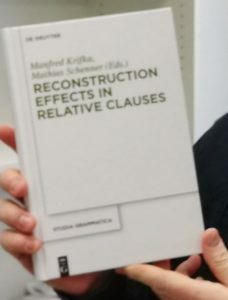 The paper contains important results of the work of the project Constraint-based analysis of relative clauses, which was part of the DFG Research Unit Relative Clauses. Webelhuth, Gert, Sascha Bargmann & Christopher Götze. 2018. Idioms as evidence for the proper analysis of relative clauses. In: Manfred Krifka & Matthias Schenner (eds): Reconstruction effects in relative clauses (Studia grammatica 75). Berlin: Akademie Verlag. 225-262.